This is a newly constructed cottage apartment, designed in an urban industrial farmhouse style, situated on a 28 acre farm in the historic town of Litchfield, CT. The peaceful, bucolic setting is enhanced by the panoramic views of the surrounding hay fields and the beautiful Litchfield Hills. A perfect antidote to the noise and congestion of urban life, this beautifully restored and maintained estate includes an1822 owner occupied farmhouse, a heated saltwater pool with adjacent pool house, a functioning barn with animal stalls, 2 large paddocks inhabited by 5 chickens (Game of Thrones women), 2 goats (Mocha and Latte) and 2 miniature donkeys (Florence and Maisie), an extensive organic vegetable garden, beautiful estate flower gardens, and an apple orchard. 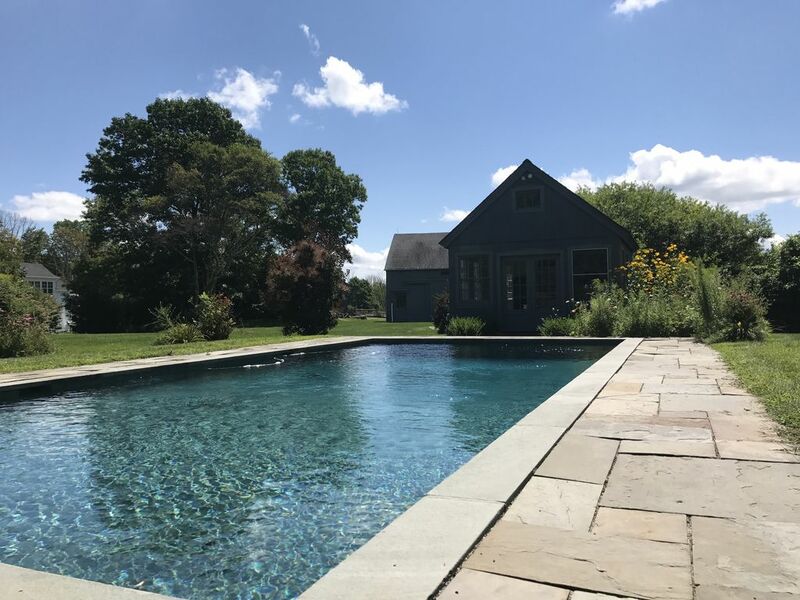 This offering provides the opportunity to enjoy the peace of rural farm life while still having easy access to the extensive recreational options, sports, restaurants, and abundant cultural activities of Litchfield County. Your stay will include private occupancy of our 2 bedroom/1 bath cottage with full kitchen, central air, queen size sofa bed in living space, access to heated salt water pool (Memorial Day to October 1) and adjacent poolhouse with treadmill, farm fresh eggs each morning, access to organic vegetable garden and potential apple picking in the fall. The cottage has its own private patio and barbecue. Our Gordon Setter Oscar and French Bulldog Zorro are farm residents; the cottage is, however, protected by an invisible fence to prevent against unwanted canine intrusion. Optional services include prearrival grocery shopping, dinner reservations at local restaurants and babysitting. Two university physicians with five grown children living with two dogs in the beautiful flora and fauna of Litchfield County. Fell in love with property on first visit and we have always loved Litchfield. variety of apple and pair trees, as well as two miniature goats and donkeys. modern well built home. This was one of the best vacation experiences our family has had and we have traveled all over the world. Litchfield features exquisite restaurants, a quant downtown shopping area, plenty of cultural events as well as agricultural attractions and working farms, and wineries. If you have young children or just want a special getaway. Nothing compares to the experience you will have while staying here.